The term algorithmic trading refers to any trading activity carried out with the help of an automated computer system. It refers to a number of approaches to both trading and investing. While there are various approaches to algorithmic trading, they all share certain traits. One trait they share is that they can all be reduced to a set of rules. Another, these approaches are almost always based on hard data rather than forecasts or opinions. 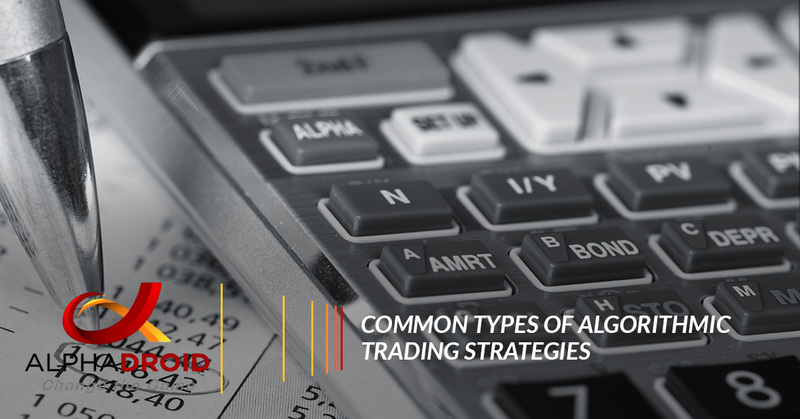 Since there are various algorithmic trading approaches for both trading and investing, to help, we thought it would be a good idea to share some of the most common and noteworthy approaches for financial advisors and investors. One of the most basic and common algorithmic trading systems followed by investors is a momentum investing strategy. This type of investing looks for the market trend to move significantly in one direction on high volume. This trading system can either be very simple or significantly difficult. A simple momentum investing strategy might invest in the five best performing shares in an index that is based on a 12- month performance. A more difficult strategy may blend momentum over time, making use of both relative and absolute momentum. Furthermore, using this system enables investors to rebalance momentum systems weekly, monthly, quarterly, or even yearly. Mean reversion systems exploit the tendency of many asset prices to revert to the mean after periods where they become wither oversold or overbought. Investors following this strategy generally assume that the price of the stock will eventually revert back to its long-time, average price. They will purchase assets when they trade at the lower end of a trading range. And, when the assets approach the center of the trading range or a moving average, investors choose to sell them. Factor-based investing is a strategy used by investors to choose securities on attributes that are related to higher returns, based on historical data. In this system, there are two main types of factors that have driven returns of stocks, bonds, and other factors. Noteworthy factors include market capitalization, momentum, earnings momentum, beta, and free cash flow. Many financial investors will combine these factors using a static weighing system, or a dynamic allocation. Some investors choose to use Exchange traded fund, or ETF, rotation strategies to optimize return for a certain level of risk. Investors can do this in multiple ways. The strategies rotate into ETFs with strong momentum to maximize return. These strategies can also move capital into uncorrelated ETFs to control risk when there are volatile market conditions. Investors use these strategies to take full advantage of patterns and trends uncovered by quantitative research, in addition to the low fees charged by ETFs. Smart beta is a strategy used by investors in an attempt to close the gap between active and passive investing. The goal of using a smart beta strategy is to lower risk or increase diversification at a lower cost than what it would be with traditional active management. This strategy emphasizes capturing investment factors or market inefficiencies in a transparent and rules-based way. Many investors prefer to use smart beta systems for portfolio risk management, diversification, and because the strategies can be packaged as ETFs, which are rebalanced every three months. A market capitalization based on the index can use fundamental metrics and other factors to be reweighed. The smart beta strategy applies to asset classes outside of equities to include fixed income, multi-asset classes, and commodities. When it comes to algorithmic trading systems, trend following is one of the oldest strategies used by investors. This strategy involves algorithms monitoring the market for indicators to execute trades. Generally, these trades use technical analysis and market patterns and indicators to make decisions. The goal of this strategy is to buy assets when prices break noteworthy resistance levels and sell short assets which fall below significant support. This algorithmic trading strategy is popular among investors because of its functionality and ease of use compared to other algorithmic trading strategies. Sentiment analysis trading strategy is determined by crowd reactions, as investors stay up-to-date on recent and relevant news and purchase stocks to predict the crowd’s reactions. The goal of this strategy is to take large quantities of unstructured data, like newspaper articles, reports, social posts, videos, blog posts. Many advisors and investors utilize this strategy to capture short-term price changes and obtain quick benefits. Statistical arbitrage systems comprise a set of a set of quantitatively driven trading strategies. These strategies to look exploit the relative price movements across thousands of financial instruments by analyzing the price differences and the price patterns. Investors use this strategy to generate higher-than-usual profits. Investors may choose to create strategies based on the time of the year. Many investors are aware that markets generally have better returns at the end of the year and during the warm, summer months. They also may be aware that September is usually a month with the lowest returns. In order to avoid capital loss, some financial investors and advisors may choose to sell their positions with losses towards the end of December to benefit from tax leniency. Plus, stock prices trend differently near the holidays and closing quarter periods. Investors who utilize this strategy should keep in mind that seasonality does not exist in one market, instead, only individual seasonal patterns exist. Algorithmic trading and investing involve a number of strategies. Some of these strategies are focused on creating long-term returns, while others are more focused on short-term returns. Many algorithmic trading strategies, like the ones above, are great for investors and advisors who are looking to optimize long-term portfolio returns while eliminating risk. AlphaDroid is an elite investment portfolio management tool that uses various algorithmic trading strategies to help predict the market by following trends. AlphaDroid trading strategies consist of a selection of up to 12 ticker symbols with a few trading rules, crash protection options, and performance testing options. These algorithmic trading strategies help advisors analyze, construct, and compare investment portfolios, giving investors the opportunity to optimize returns by moving to wherever the money is flowing. Interested in learning more about AlphaDroid and how it can help investors reap big returns? Visit our site today!